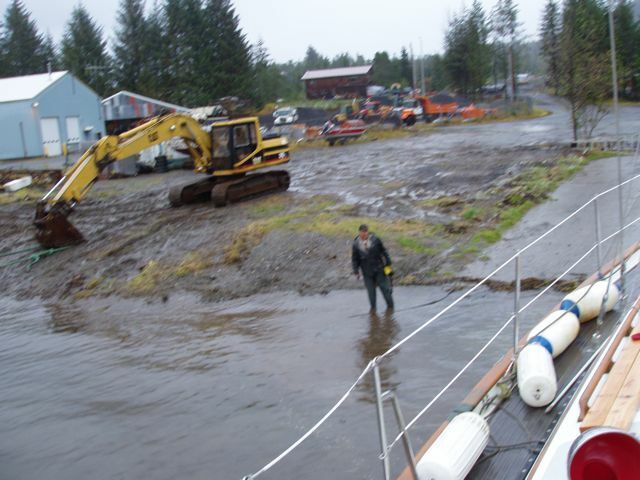 The haul-out: For the first time ever, we are leaving the boat on the hard. Although it's the usual thing to do for many boaters (and something that we'll undoubtedly do often later), it's not something that we've ever done. With a single day of clear skies on Friday, we pulled and packed sails, then stored them in our heated storage unit. 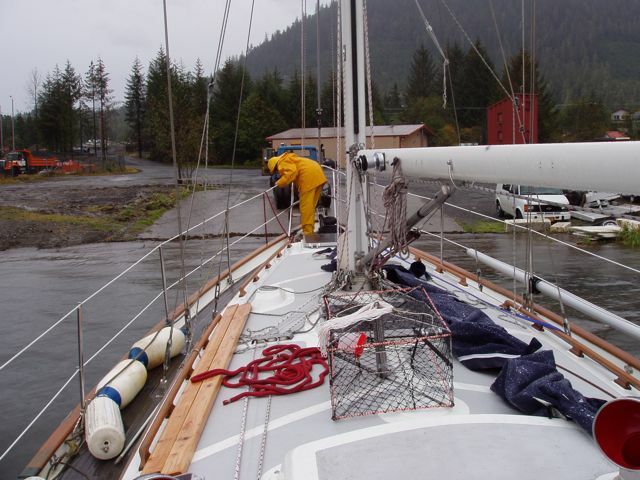 We also managed to pull off the Bimini, so most exterior items are dry and stored, a huge relief. We'll also store our electronics, a lot of clothing, some books, and cockpit cushions. 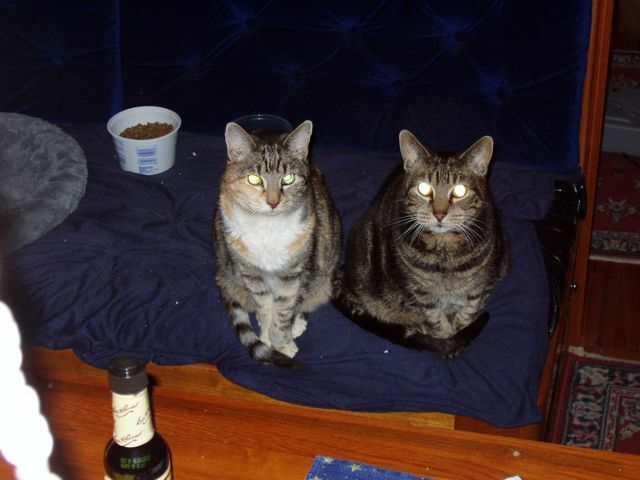 This has been a class operation from the first and we feel confident in John Murgas' expertise. 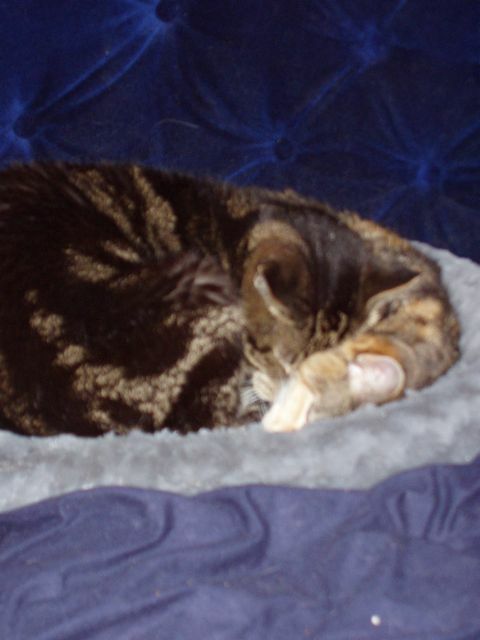 Pre-haul-out cat nap in the usual position. 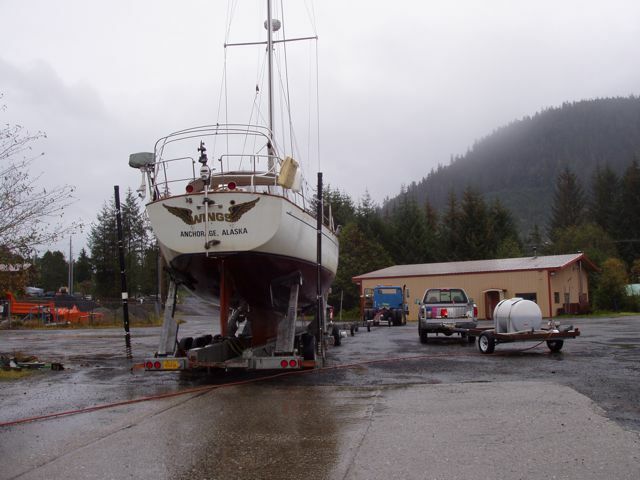 As we are aligning the boat onto the trailer, Conni helps by calling our location to me. The cage in the center of the deck is our new crab pot with line stored on top. The wood will be fabricated into boom supports for stability when it acts as the ridgepole for the winter cover. It was raining so hard! The large blue item starboard side is the "Lazy Bag" for the main. 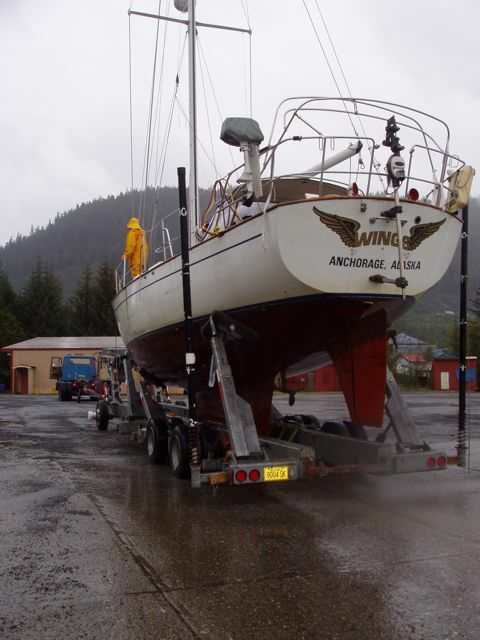 With Wings on the trailer, John Murgas checks our alignment. The yellow box is his remote control for the trailer hydraulics. The ramp is an old sea plane ramp that extends far out into the water. The 19 foot tide helps, too. Just after being pulled from the water, Conni watches the towing truck. 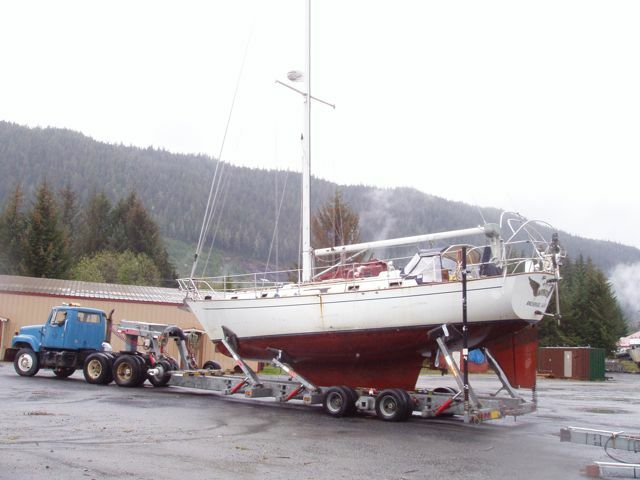 To get the trailer into deep water, but not his towing truck, John adds several extensions. Wings on her trailer. 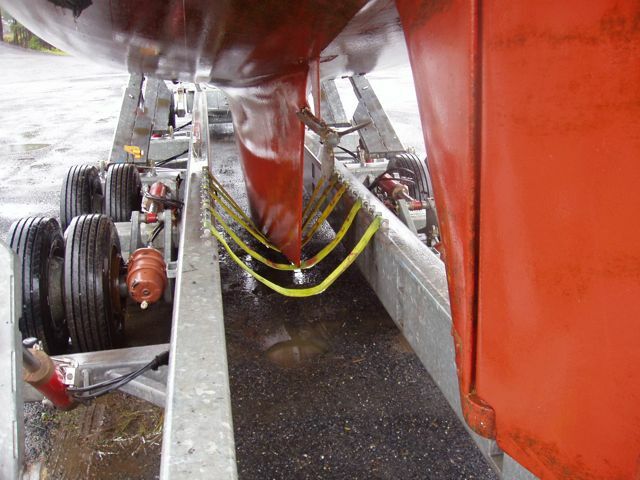 There are three hydraulic arms along each side that extend pads to the hull. 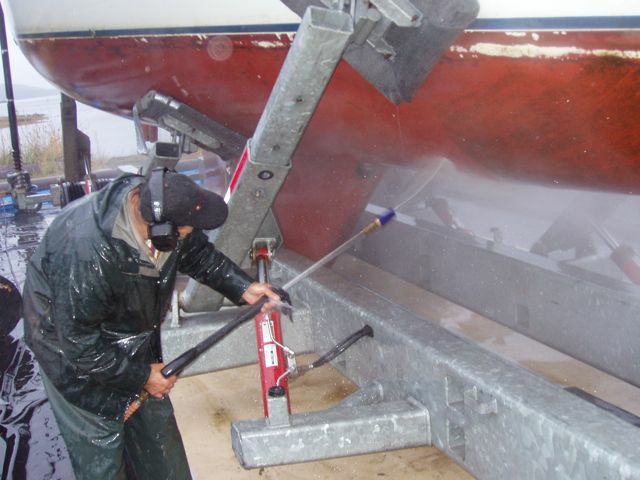 Our keel resting on the nylon straps supports the entire boat's weight. 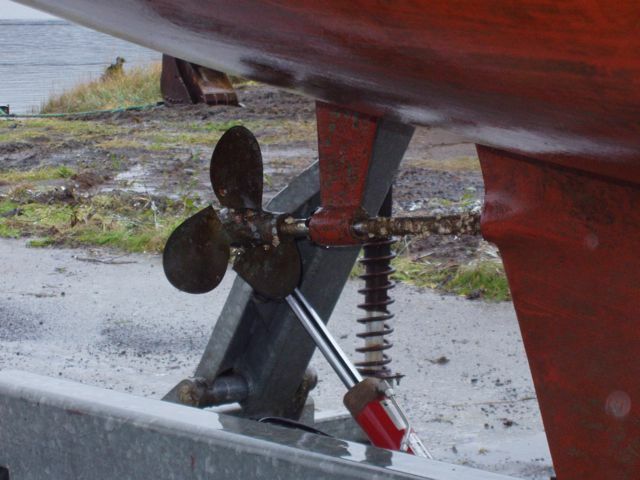 Note the hydraulically controlled wheels that can raise and lower the entire boat and trailer. Wings on the trailer. John's power washing equipment is on the trailer at right. Barnacles and mussels on our depth sounder transducer! Holy smokes, it's a wonder it worked at all! Our MaxProp propeller, a feathering prop. When sailing, the blades align parallel to the water flow so that they present only the thinnest area, thus reducing resistance. 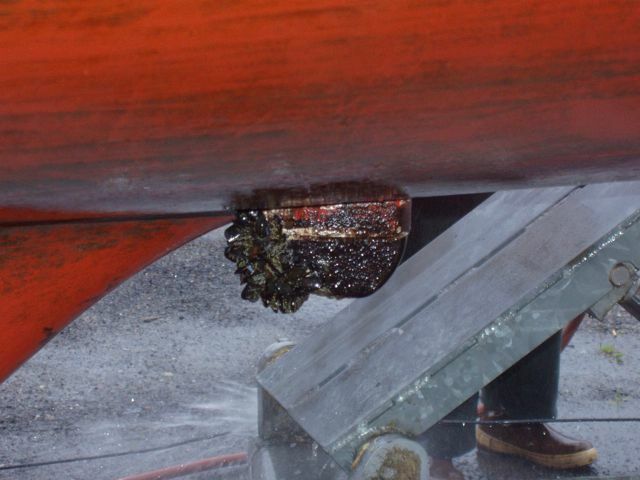 Note the barnacles on our prop shaft! Wings on the trailer. She's a dirty bird after our long summer trip. This is a good view of this marvelous machine of John's. His trailer extensions are at right. The boat is down by the bow a bit too much. The long dark stripes on the hull, forward, are the marks of mooring buoys that we've used whenever we could find them. 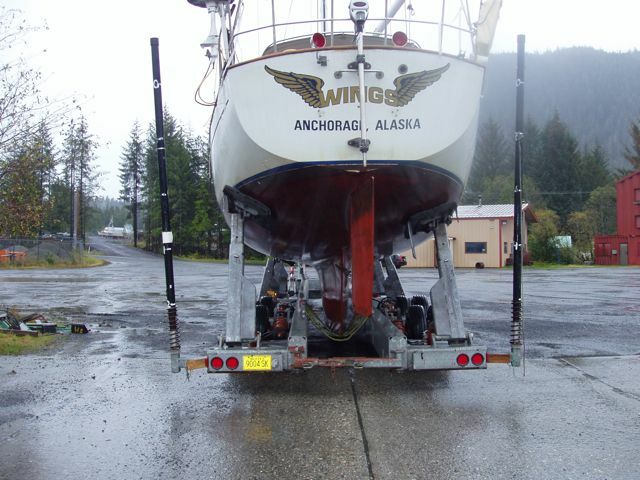 We prepare for pressure washing Wings. She's been towed to the tarped area for washing. The ground cloth is visible, into which the washing effluent is trapped and pumped into the waiting holding tank. The pump is the right front of the washing area. The water is filtered three times, and then recycled. Remember that bottom paint contains up to 40% copper and is very toxic. 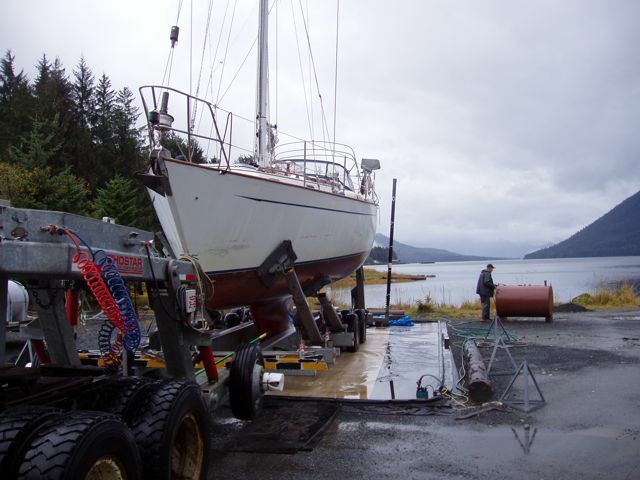 John Murgas uses a "rotary tip" pressure washer to remove slime and loose paint from the hull. This is a preparatory step to next spring's sanding and painting. It's much easier to wash off then sand off!